Matt Sherman (Cary Grant) is the commander officer of the USS Sea Tiger, during World War II. After a Japanese air raid the sub is severely damaged, but Sherman insists he can fix it and get to a safe port. For that he’ll need the help of Liutenant Nicholas Holden (Tony Curtis), a gold-digger and con artist who becomes the sub’s supply officer. While they can successfully repair the ship and begin their journey towards Darwin, there will be many bumps along the way, amongst which a group of female Army nurses who join them aboard, and the famous color pink that the sub will acquire. Like the previously reviewed Sabrina, Operation Petticoat (1959) is an entertaining film that deserves our attention for the immensely talented cast that supports it. 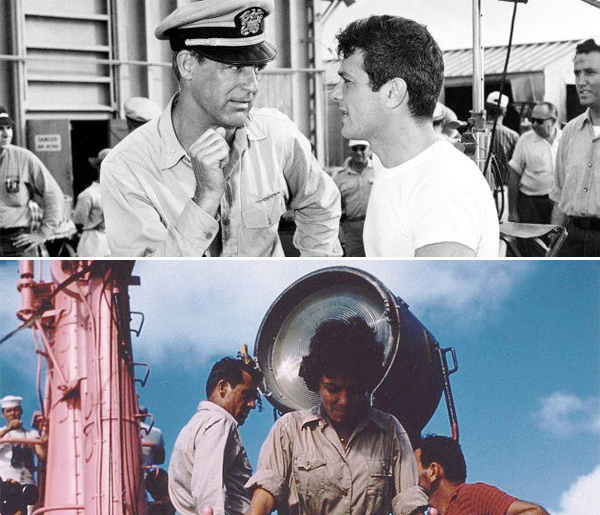 Curtis wanted to co-star with Grant in a movie about a submarine since he saw him in Destination Tokyo (1943), when the latter became his hero and inspired Curtis to actually enlist in the U.S. Navy at age 17, during World War II *. So no wonder they work great together, something that only makes it the more compelling to watch this film. In the hands of director Blake Edwards (Breakfast at Tiffany’s, 1961), Operation Petticoat unfolds with enough wit, talent, and astute comedic tempo to make it a pleasant watch. Even if there isn’t a clear plot to suport it, we stick with it for the continuous and deliciously funny situations Sherman and Holden find themselves in.